Have you checked out our extended range of uniforms for canteen staff? We design and manufacture in the UK, uniforms for the health, clinical, and care sectors. By buying direct from us, you can source canteen and kitchen uniforms at good value prices with reliable supply. There’s no minimum order. This means both staff, businesses and organisations can buy direct from us. Customers making large orders, benefit from account terms if desired. We supply Aprons and Tabards, Coats, Coveralls, Headwear & Neckties, Jackets and Trousers. This means uniforms are available for everyone from chefs to kitchen porters to serving staff. Our in-house embroidery service is able to add names or logos to any garment. Fabrics are hardwearing and easy to care for with a wide range of sizes available. Many garments are available in a choice of colour. To find the correct size, click on the Size Guide link next to each garment. Different styles of tabard and aprons are available including a Shaped Tabard with Pocket, Bib Aprons, Butchers Bib Aprons and Long or Short Waist Aprons. A Chef’s Large Waist Apron is also available. With the exception of the Chef’s apron the other aprons and the tabard are available in different colours. The Tabard for example is available in no less than 9 different colours and a Saver Pack of 10 Tabards is available. It’s possible to mix and match sizes. Our Food Industry Coats are popular with general canteen staff including food porters and prepping staff. These include a Ladies Catering Coat which is also comes in a Saver Pack of 5. Food Trade Coats either with an upper or lower pocket in a wide range of colours and a Saver Pack of 5 Coats with Upper Pocket is available. The Food Trade Coverall offers maximum coverage and comes in a choice of 5 different colours including white and has internal and external pockets. For comfort it has an action back and side-elastication. It’s a real workhorse. Headwear is important in a food environment. Our range includes a Peaked Pork Pie Hat, a Peaked Hat with Mesh Snood and a Ladies Bazeley Hat. A choice of colours is available including white, royal blue and navy. We also offer a Necktie in super white or smokeberry. As you might expect our selection of Jackets includes chef’s jackets in various designs including a unisex style. Completing the range are the Food Trade Jacket and the Warm Area Long Sleeved Top. All of these jackets and tops have been designed to be comfortable and practical. Finally, for canteen staff we have our Catering Trouser range. Styles include a Ladies Chef’s Trouser in Blue and White or Black and White Gingham. Male versions of these trousers are also stocked. Food Trade Trousers are also available with a Half or Full elasticated waistband. Unisex Chefs Trousers come in navy or black. Completing the line-up we have Trousers with Sewn-In Front Creases in white or royal blue. All unisex or men’s trousers are available in Regular and Tall leg lengths. 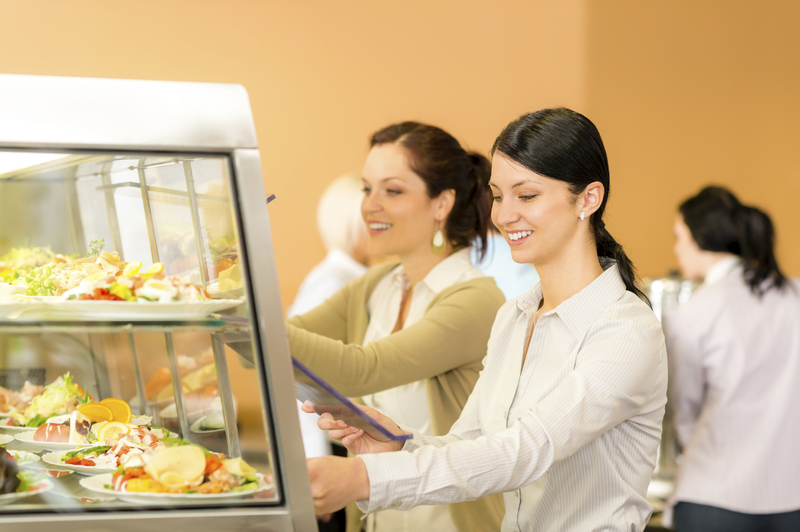 Summing up, we can supply canteen staff with all their uniform requirements with reliable supply and friendly knowledgeable service. Our in-house customer service team is based on site and would be happy to discuss your requrements.